Christmas Green & Red + LASERS & FIRE = One killer cover from Frazer Irving!!! Brian Michael Bendis takes his foot off the throttle for this week’s issue (just a bit) and zooms in on Illyana “Magik” Rasputin. We’ve seen how the events of Avengers Vs. X-Men have affected Cyclops, Emma, and Magneto (and Colossus over in Cable & The X-Force), but this is the first issue to really consider Magik’s state of mind in this new Marvel status quo. And it’s a trip to say the least. After a four-issue arc in which Scott Summer’s new group of mutants learned the ropes by FIGHTING THE AVENGERS, Uncanny X-Men #5 steps back from rugged spandex and burgeoning superheroics and steps into Hell. Well, Limbo to be exact, but still—Demons and Dormammu and Hellfire and Brimstone. Bendis (who is no stranger to the magical side of the Marvel U after his work with Doctors Strange and Voodoo) spends a larger portion of this issue in flashback mode with Magik confronting the Lord of the Darkness in her former kingdom of Limbo. The flashback is framed by a very personal conversation between Scott and Illyana, a welcome insight into the friendship between these characters; without moments like the conversation in this issue, many readers might think that Cyclops and his mutants are just a band of soldiers. The empathy portrayed here on Scott’s part helps round out the emotional resonance of these new X-Men. Meanwhile, the new recruits continue to be fascinating, fresh characters. Small character beats lay the seeds for larger drama down the line, particularly between Emma Frost and the younger recruits. Uncanny X-Men #5 presents a significant shift in tone and mood from the previous four issues. A lot of this change can be attributed to the transfer of art duties from Chris Bachalo to Frazer Irving (Batman & Robin, 2000 AD). 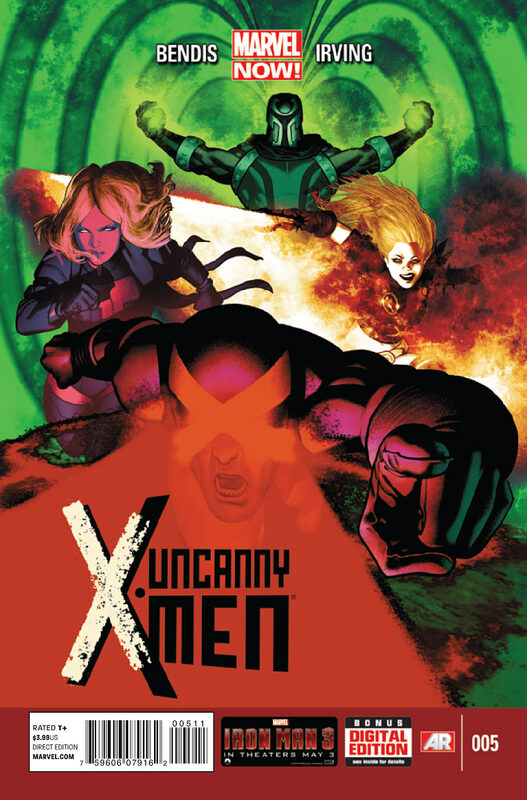 Bachalo’s hyper-exaggerated, eye-popping, panel-packing aesthetic lent the debut issues of Uncanny X-Men a fast-and-loose vibrancy, perfect for hooking readers in to Bendis’ radical team of mutant revolutionaries. With Irving, however, the comic takes on a heightened sense of Magical Realism, apropos considering the decidedly supernatural trappings of this issue/arc in particular. While there are some shadowy, muddled panels under the blurs of hellfire and ash, Irving’s work is for the most part visually engaging and fascinating. His rendition of Illyana’s Darkchilde form (throwback!) is particularly menacing, and I’m sure the ambiguities will iron themselves out as his run on the book continues. Buy it. With issue #5, Bendis is taking us down a supernatural path that has been missing from the flagship X-titles. Sure, we got Limbo related stories in New X-Men and New Mutants and Peter David is bringing the demons in X-Factor, but I can’t recall the last time Dormammu or hellspawn showed up in Uncanny X-Men. Along with this new direction comes a new artist, and Frazer Irving brings Uncanny a refined visual aesthetic reminiscent of some of those classic Claremont-era X-stories like God Loves, Man Kills and the definitive run of New Mutants. This is an excellent issue of an excellent new series. Jump on and enjoy the ride!! !